The Lifeboat Seafood restaurant is located right on the waterfront in the town of Brooklyn within easy walking distance of the Hawkesbury River train station on the main Sydney to Newcastle line. In addition to this there is also plenty of car parking and a nice riverside park a short walk away which makes a handy place to eat you food if you’re in the mood for a takeaway. The building itself is connected to the Hawkesbury River Fish Co-op where we saw some of the local fishermen land their catch so all the seafood they sell is caught in New South Wales. In addition to the restaurant they also sell fresh seafood as well with a large display case full of all sorts of fish and the like. It is also licensed so you can get a drink there if you like but I’d say the BYO option is a better bet. We decided to have lunch at Lifeboat Seafood as a result of our going for a trip on the Riverboat Postman earlier that morning. As part of the Riverboat package we had a Fish and Chip lunch for $12 per person. Once we arrived at the place, we wandered inside and let them know we were there and ready for our lunch. We were told to take a seat and that the food would arrive shortly. I must say that at the time I had my doubts because there were around 20 of us all arriving at once off the boat however ten minutes later the food started to come out so we were pleasantly surprised. The Fish and Chips were beautiful and obviously freshly cooked. The plate presentation was appealing and overall the staff were friendly and efficient. There’s not really much more to say than that, it was a great lunch to finish off a nice day on the water. See our Riverboat Postman page for more details on the cruise. 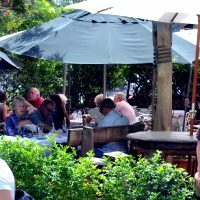 The restaurant has a reasonable amount of outside seating making it nice on a sunny day but as the only protection from the weather was a series of large umbrellas I’d steer clear if it looks like rain.